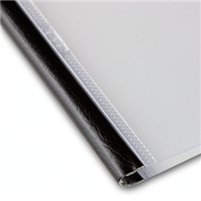 The Unibind SteelMat Covers are unique thermal binding covers with frosted matte plastic and a steel u-channel spine. Pages are set in the appropriate sized channel, the patented resin is warmed-up to a liquid, and the pages are adhered to the spine in a matter of seconds. Bind documents up to 340 pages with a frosted transparent front and back cover for a professional finish.